On this 6 hour tour you’ll be treated to stories about the neighborhoods, diversity, and geography of the area. We will exit the bus at several stops for photo opportunities and exploration, without making you feel rushed. 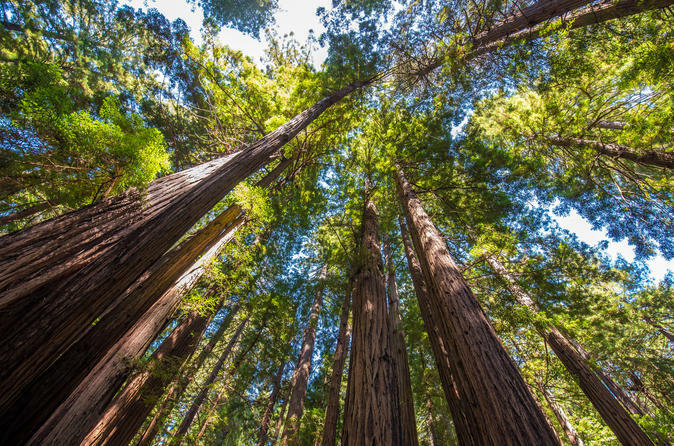 Your tour also includes a confirmed reservation to beautiful Muir Woods Redwood National Park . After a brief roll call, we’ll board the bus and travel to our first stop. Over the next 6 hours you’ll be treated to stories about the neighborhoods, diversity, and geography of the area. We will exit the bus at several stops for photo opportunities and exploration, without making you feel rushed. This tour also includes your confirmed reservation for over an hour in beautiful Muir Woods Redwood National Park . At the end of our amazing adventure, we’ll drop you off at the same location where you boarded the bus. All tour buses and vans are prohibited from going near Lombard Street, but we are happy to drop you close by at the end of the tour.